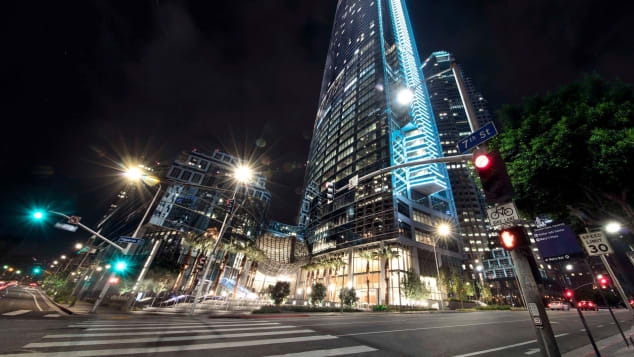 Los Angeles (CNN) — The InterContinental Los Angeles Downtown opened in 2017 in the sleek and sparkling Wilshire Grand Center, bringing a notable new landmark to the city: Spire73. The outdoor bar and cocktail lounge is located far above L.A. on the hotel's 73rd floor, making it the highest open-air bar in the Western Hemisphere. InterContinental guests and the public alike can take a smooth, quiet ride in the hotel's elevators to that towering perch, where they're greeted by 360˚ views of sprawling Los Angeles below, including Dodger Stadium, the Hollywood sign, the Griffith Park Observatory and the Pacific Ocean. Also visible: notoriously traffic-heavy Highways 10, 101 and 110, where miles-long trails of red and white lights twinkle into view as the sun sinks below the horizon each evening. Playing up Los Angeles' often warm weather, Spire73's patio is furnished with a variety of seating scenarios, including a sleek bar; wire-frame armchairs and tables arranged beneath large umbrellas; low-slung, shaggy sofas tucked between clean-lined fireplaces; and high-back chairs nestled along the lounge's perimeter, directly overlooking the city. Despite the bar's roughly 1,000-foot height, there's no need to worry about chilly winds. Thick, glass walls keep the breeze at bay, and servers are happy to offer up plush blankets for extra insulation when temperatures dip. Of course, Spire73's main attraction is its drink menu, which emphasizes classic cocktails with updated twists. Not sure what to order? 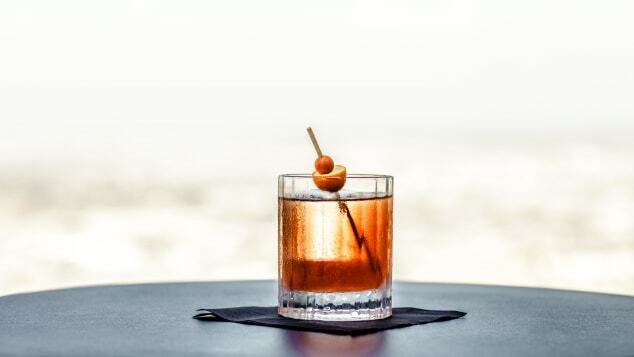 Here are three signature tipples to drink in along with those jaw-dropping views. .
Spire73 makes its Kumquat Old Fashioned with Suntory Japanese whisky. Traditionalists won't want to miss this updated take on a timeless favorite. Japanese whisky and fresh kumquat give Spire73's version a lighter mouth feel and a slightly sweet taste. "This is our twist on an Old Fashioned," says Martin Romero, Spire73's assistant food and beverage manager. "We use Suntory Japanese whisky as opposed to any regular scotch or bourbon, for starters. We muddle the kumquat in the drink and then we strain it, so you're not going to get any of the actual fruit in it. We use pure cane sugar in this, and we top it off with a little muddled kumquat, which gives it a little bit of sweetness. It's very nicely balanced." Jun Sur, the hotel's food and beverage director, explains that when it comes to Japanese whiskies, "Yamazakis, Suntorys, Hibikis, they tend to be [made] in elevations that use purified, clearer waters, which makes the whiskies a little better, and it gives [them] a floral essence, a fruity essence, so it's a little different from a regular Old Fashioned. "A lot of people are not whisky or bourbon drinkers precisely for that reason; they can be very heavy. [The Japanese whisky] is not as heavy as a traditional whisky or bourbon," Sur says. The Scotch-based 1100 Feet is Spire73's best-selling cocktail. Taking its name from the building's height -- including its signature spire that towers above the bar -- the 1100 Feet, which is Spire73's best-selling cocktail, also pays homage to Los Angeles' cultural mix. "We wanted to go first and foremost with the actual height of the building, which is 1,100 feet, but, more importantly, it's got a little bit of everything [in it]," says Romero. "It really is a testament to the blending pot that we have here in L.A."
The cocktail's main ingredient, the single-malt Glenmorangie Scotch, is made in Ross-shire, in the Scottish Highlands. Rhubarb bitters, which Romero describes as "herbal and bitter," are a product of Jamaica, as is the drink's dried-apricot garnish. D.O.M. Bénédictine, an herbal liqueur that consists of 27 different spices and herbs ("None of them really overpower the others," Romero says), comes from France. Rounding out the 1100 Feet's ingredients is Lillet Blanc vermouth, which gives the drink a touch of dryness. 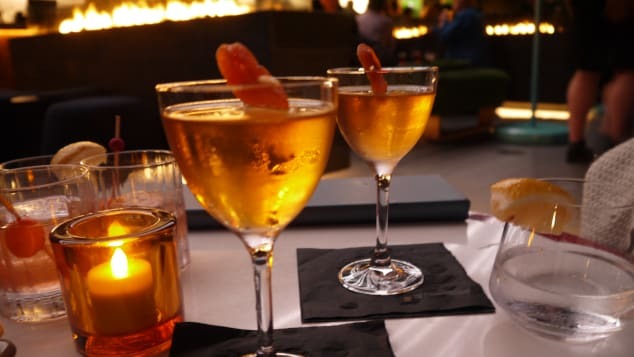 "[Glenmorangie is] a Scottish whisky which I adore, so I wanted to use it as a base, and we use a little bit of Lillet Blanc and some Caribbean bitters to make it a little bit more interesting," says Florence Granteral Fall, the food and beverage manager for Spire73 and the InterContinental's Lobby Lounge. "We decided to have a fairly multicultural beverage list, and this drink is an expression of that." If your taste buds lean the way of tequila, Spire73's updated Paloma is a winner. It gives a nod to Korean Air, who built the Wilshire Grand Center and occupies a portion of its office space. "[Korean Air's] chairman is a big fan of Makgeolli," says Fall of the Korean spirit that her team added to their version of the Paloma, a drink typically made by combining tequila and grapefruit soda. "Makgeolli is a rice spirit, and it's a very difficult alcohol to marry. We found that it goes well with the Código tequila, which is a small-collection artisanal tequila aged in French oak barrels from Napa Valley. It has a very specific flavor." Agave and lime add hints of sweetness and tartness, respectively, while grapefruit juice and Mixwell grapefruit soda give the cocktail a slightly bitter but clean finish, and a just-right dash of effervescence. Spire73 is in the InterContinental Downtown Los Angeles, housed in the sparkling new Wilshire Grand Center. 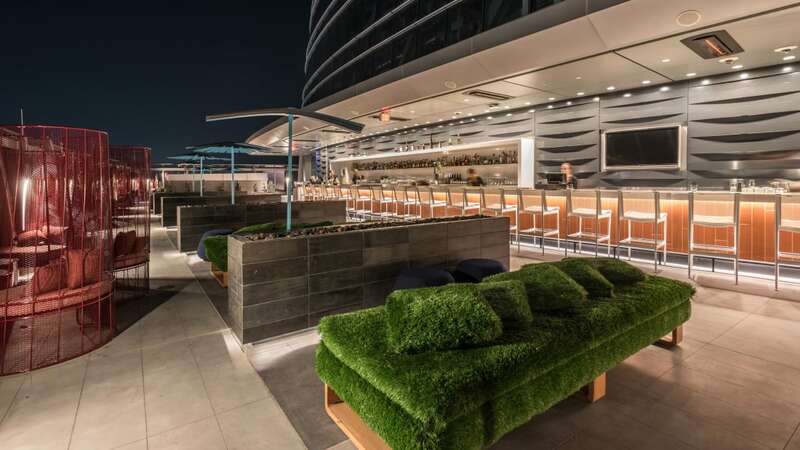 Although you won't want to miss a visit to Spire73, the open-air bar isn't the only food-and-drink option to explore at the new InterContinental in Downtown Los Angeles. The 889-room hotel is also home to Sora, a sushi restaurant complete with a sushi conveyor belt and an array of Japanese whiskies; Dekkadance, a "farm-to-fork" buffet restaurant whose $75 Sunday brunch includes bottomless glasses of bubbly; and, on the 71st floor, the fine-dining steakhouse La Boucherie, which serves traditional French fare, premium steaks, seafood and fish alongside a 1,200-bottle wine list and cocktail menu. If you're as picky about your cutlery as you are your cuts of meat, you'll feel right at home at La Boucherie. There, restaurant servers make tableside knife presentations, ensuring each patron picks just the right tool for the task. An elaborate mustard-pairing presentation and a flaming chocolate soufflé round out La Boucherie's more sensational highlights. Lindsay Lambert Day is a freelance travel and lifestyle writer based in Atlanta.